All payroll clients of ASAP will receive an EFTPS® Inquiry PIN letter like the above image shortly after starting with us. This letter will allow you to log in to the Electronic Federal Tax Payment System® (EFTPS) to view the Federal tax payments (941/940) we make on your behalf. We make IRS payments via an EFTPS® batch provider software rather than utilizing any EFTPS® enrollments your company may have established previously. 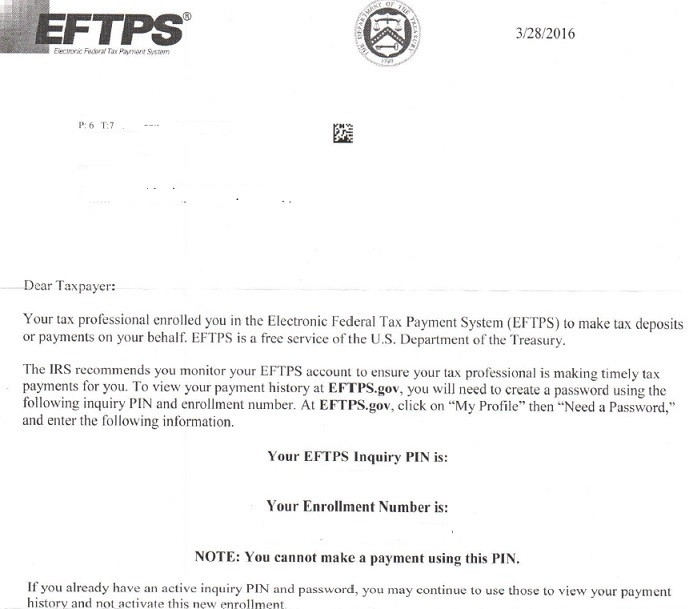 The EFTPS® Inquiry PIN letter provides employers with instructions on how to independently verify the payments since they are not view-able using any prior EFTPS® payment enrollments. It should be noted the EFTPS® Inquiry enrollment only allows you to view payments. If you have any outstanding tax payment obligations, you should continue to use your prior EFTPS® payment enrollments as before as they are still active. If you have trouble with the enrollment process, you should be open to contacting the EFTPS® support team directly. After all they are in the business of collecting money, so they tend to be extra fast and helpful as opposed to other areas of the government. To reach customer services in regards to the EFTPS® Inquiry PIN, call 1-800-991-2245. To reach an EFTPS® customer service agent for other matters; call 1-800-555-4477. Unfortunately in our industry as in others there have been a few bad actors or worse frankly that have failed to live up to their responsibilities and essentially stolen from their clients. The liability for payments does not dissolve for the employer while using a third party provider despite our pledge and guarantee. This IRS effort aims to provide employers with a better means to independently verify payments. As the saying goes; Trust, but Verify. We strongly encourage it too. Here is an article that we first created and shared with clients in 2010 and have updated since which discusses “The Taxpayer’s Liability” in more detail and how outside of ASAP you may verify payments are being made as promised. We also remind clients every quarter of this in our newsletter in a section specifically discussing this liability with a link to the updated instructions as they change.